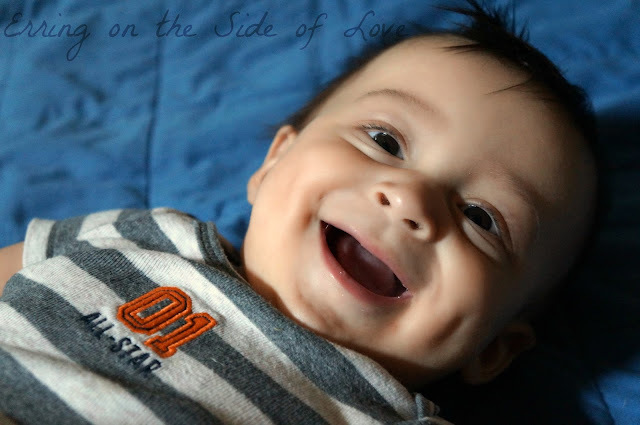 Erring on the Side of Love: Theme Thursday: Sleepless in the Mommyhood FAIL! Remember the boy that decided he wanted sleep and I - two friends who have gotten along for so many years - to break up? Yes, the same sleep I consider to be a kindred spirit. My go-to friend for when I just need to rest, chill, hang, love, be happy, etc etc etc. Well, the boy (also known as Linus around the blog-hood), is at it again. Yes, sleep and I are still trying to work things out during the night. That hasn't changed. Our relationship is touchy at best. And, during the day we don't even bother to hash out things via naps. We just don't have that luxury at the moment. So, Linus thought he'd venture a different route to further distance my friend and I. See, Linus decided recently that it's high-time to conquer a mobility baby milestone. He is a wanderer during the day and night. The boy is army-crawling EVERYWHERE! And friends, as much as I am thrilled for my son and his milestone (I really am! ), I completely underestimated how good he is at it! Let me explain. I drink coffee. Everyday. Coffee and I are still friends. Very good ones, in fact. So, when I put my coffee down on the rug for 2-stinking-seconds, I did not think that the little one would high-tail it to the mug in 0.0 seconds! By arriving at the scene, an honest half-second after those little hands grabbed the mug, some of the yummy goodness had already spilled onto the rug and onto the attacker (A little aggressive of a word, I know. But it is what it is. He attacked the mug.). At first, I thought, no biggie. Just a little wipe down for the little man, and a towel to soak up part of my morning-afternoon buddy (Because, let's be honest, no one has time to finish a cup o' joe at one sitting with littles around. Or at least, non-morning people such as me, don't.). But then I saw Linus thoroughly enjoying his right hand. The same hand that still smelled like coffee. Oye! Will he be awake all night for the next week because caffeine was absorbed through his skin? How much coffee is too much for a 7 month old? Did he really get anything from sucking on the fist that had a few glob-drops of coffee? He seemed pretty stinking HAPPY after sucking on his fist - does this mean that I've created a baby coffee addict? If a babies' first taste, aside from breastmilk and rug fuzzies, is coffee will he never eat real food ever ever ever because coffee is so amazing???? I know. I know. I'm being a little over-reactive (right?). I'm just a little sensitive. You know, the whole sleep deprived thing and all. So aside from my internal/blogternal freak-out, I'm really hoping this doesn't affect the little guy. We are starting solids this weekend! Naturally, something like this (which probably isn't a big deal, but is in my sleep-deprived brain) would happen the week before he is about to embark on his awesome taste journey! At the very least, the little guy is incredibly cute! And, his coffee-smelling-fist which he sucked on more than I would have liked provided for some pretty awesome laughs, giggles, and smiles. I'm just praying that God give me the grace to graciously wake-up for my coffee-liking, teething, non-sleeping, sweet baby boy. That said, I'm calling this a little (depending on how the night goes, we may upgrade to major) Mommyhood FAIL! Teething, non-sleeping, sweet baby boys do not need to be within 10 feet of any mug of joe. Ever. Ever. Ever. Hop on over for Theme Thursday at Clan Donaldson. The theme is text. There is text on the cuties onesie and coffee. This is his coffee smile. Hahaha! Best smile, ever, anyway! haha, thanks :) His gummy smile does tend to melt me. Ever ever ever? I love that line. I have had that exact thing happen to me, I'm sure. Probably more than once. My kids still ask for 'dips' of my coffee (one finger, only with permission) so maybe your addict theory holds water. Sorry to be the bearer of bad news. Sweet baby boy, though! Sleep soon! Haha! Yes! Living on looks they are! Toddler lives on them during the day since he's so great at night and the little lives on them at night. At least they both aren't striving for best looking at night? right?